In this issue of Ameri-can Tax Talk Newsletter, Mark Feigenbaum discusses the “Surface Transportation and Veterans Health Care Choice Improvement Act” being signed into law on July 31, 2015. There are a number of changes contained within the law resulting in changes to US tax law for some return due dates that will affect many if not all US citizens living outside the United States. 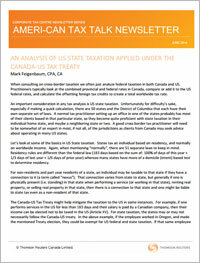 Sign-up below to download this issue of Ameri-Can Tax Talk Newsletter.